Two Bears Farm and the Three Cubs: Flying Squirrels and Come Check Out My New Look! Flying Squirrels and Come Check Out My New Look! First off, how do you like the new design? I worked with Stephanie from Dirt and Lace Designs and she is awesome. She was really patient with all my totally weird unusual requests like whether she could use a picture of our log walls for the border. And she totally made it happen! Anyhow, she was great to work with, and if you need anything done on your blog go check her out. In other news, today is Show and Tail Tuesday over at WV Treasures. Since I haven't participated in a while, I scanned in some pictures of our darling flying squirrel. Back when we were trailer trash, he lived on the roof of our trailer. What? I haven't mentioned the whole trailer thing before? Yes, when we first bought our land we lived in a single wide until we could afford to build our log home. A very long six years, you might say. So anyhow, this little guy built a nest in the gutters on our roof. They are nocturnal, so these pictures were taken by Paul late one night. Isn't he (the squirrel, not Paul, although he too can be cute at times) the cutest? In this picture, you can see the extra flap of skin on his sides that would spread out so that he could fly. Sadly, he disappeared one day. 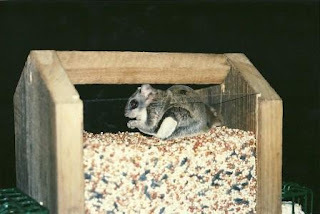 But I hope that we see these little flying squirrels again on our place in the future. I love the new design. It loads faster too. The other one had a delay. I love your new look. The designer did a great job keeping the feeling and tone of your blog while making it really polished. Congrats. Love the new look, Lisa! And that squirrel is too cute! Awesome blog design. Love it! Your blog looks great! I like it's fresh new look. That squirrel is mighty cute. I have never seen one around here, but supposedly, they are here..
Lovely blog! 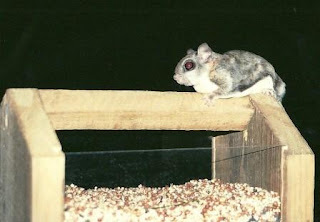 We had flying squirrels as well! Curious little fellows too. I like the new look too! And yes, it does load faster! I love your new look! I forgot to mention it yesterday. Whatever you did it made your blog pull up faster than it did before. I didn't think you had much on it but it was a slow loader. Not it's speedy fast! I haven't ever seen a flying squirrel before! I don't know if we have them here around our farm or not. He sure is a cutie! Much smaller than the squirrels we have and without that big long bushy tail. I hope you start seeing them again! I'm sure the boys would love seeing them. Thanks for visiting my blog. I have to say that I have never been able to get a good look at a flying squirrel. I have seen them in action while camping by never like this. Really cute! I am loving your blog....you are one busy lady. Hey..thanks for stopping by...love your blog..so modern looking for 2011. Looking forwarad to reading your past and future posts.. I love squirrels!,and your new look!..love your blog. I love your new design, it looks great!!!! I love the new design! And the squirrel is cute! Great new look! Very cute! My grandma raised flying squirrels. They are darn cute little creatures! Even if they remind me a bit too much of rats! Lol! Oh my goodness, these comments made my day! We have many squirrels here at Buttermilk Cottage, but not of the flying type. Sorry he ran away, to seek his fortune I bet. I linked with Angela very late and wanted to give you an invite to come over and visit. He is so cute!! Too bad he disappeared on ya. The boys would have loved him!! I also love your new design, she did a great job!! and so did you since it was all your ideas! Love it! Awwww....he's just the sweetest little critter - they look a lot like suger gliders, don't they? I've never seen either in real life and have always wanted a sugar glider, but I probably won't get one to keep as a pet, because I don't want him caged up. In response to your comment, I have a television only to watch my VHS/DVDs and the only channel I get with my rabbit ears is public television (commercial free) and educational. I don't like commercial TV anymore either and have lived without a TV for over a year and not even missed it ;-) I think more people should get rid of their TV - it's such a time waster! How cool is that! I hope you see more in the future too. AND, I LOOOVE your new design. I think I already told you that but incase I didn't, It is awesome!! !